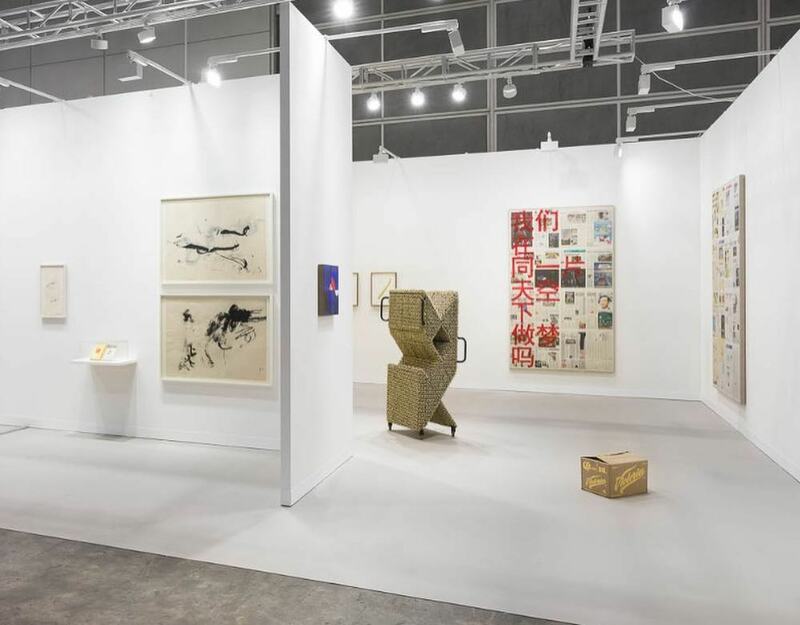 Art fairs are perhaps one of the most intense experiences for visitors, the overwhelming halls of the Hong Kong Exhibition and Convention Center are enough to intimidate (or irritate) anyone . 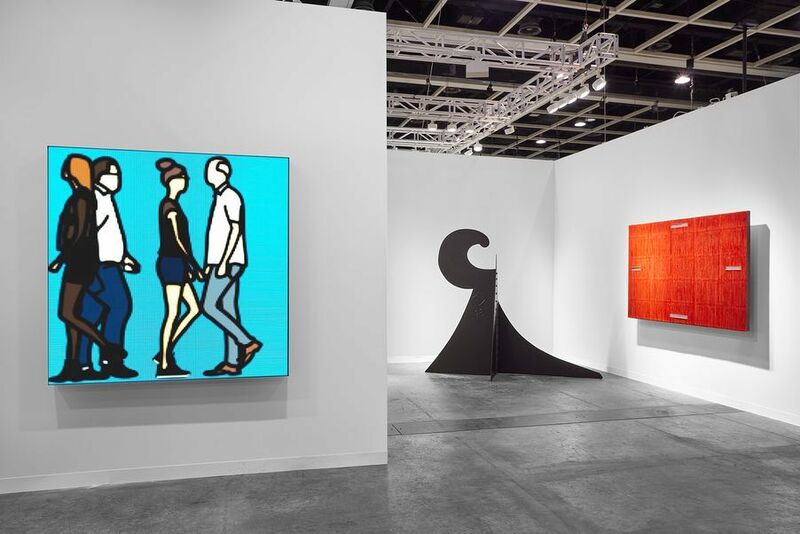 As Art Basel descends upon the city, we try and make your life a little easier by selecting ten booths we think are worth the visit! Images: Courtesy of Galleries and Artists. 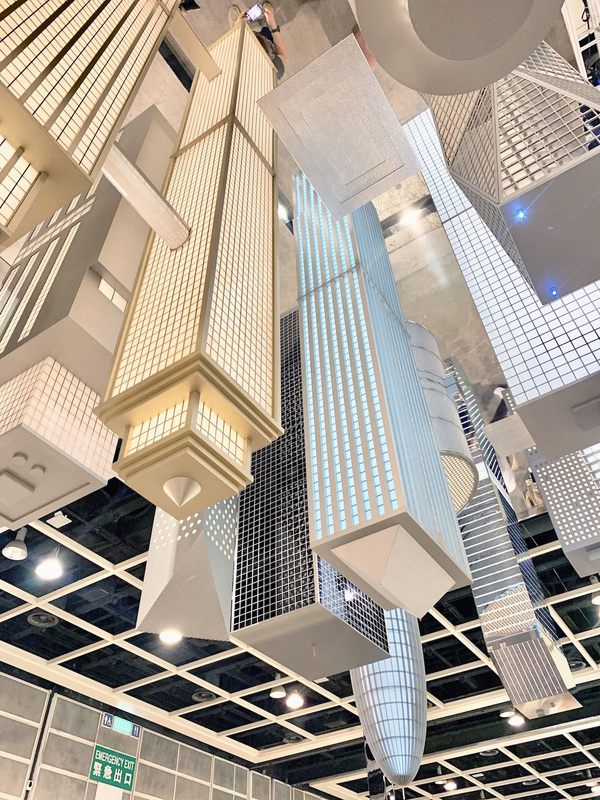 Featuring a roster of stellar artists, including Erwin Wurm, Do Ho Suh, Kader Attia, Lee Bul, Mcarthur Binion, and Nari Ward, Lehmann Maupin’s booth showcases an array of visually striking works. 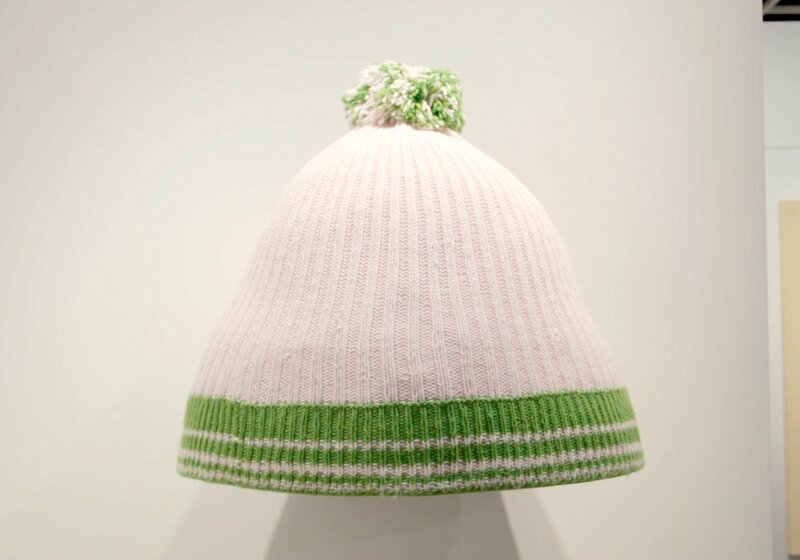 From Erwin Wurm’s whimsical interactive oversized Austrian mountain cap to Do Ho Suh’s luminous and airy creations, highlights are present at every turn you make. 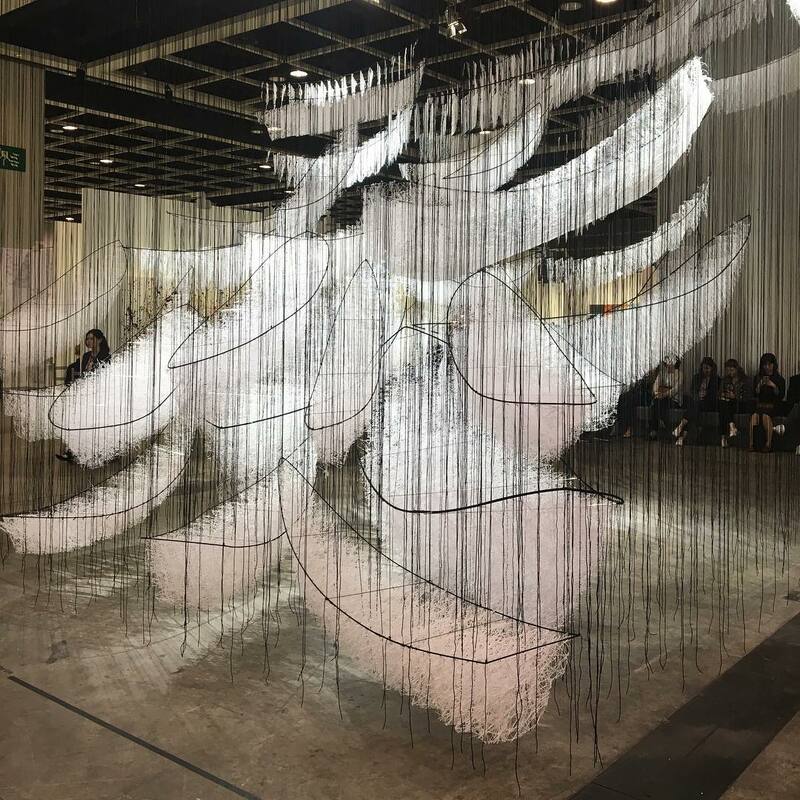 But the specially curated Kabinett sector is comprised of the most exquisite pieces by Lee Bul- featuring pearls collaged onto velvet, leather, and silk surfaces along with materials such as human hair, acrylic shards, crystals, and dried flowers characterize these stunning works. Vibrant and compelling, Yoo Youngkuk’s rich canvases lead a selection of works by Dansaekhwa artists including Park Seo Bo, Lee Ufan, Kim Yong Ik, Kwon Young Woo exhibited alongside works by contemporary Korean artists such as Gimhongsok, Kyungah Ham, Haegue Yang, Suki Seokyeong Kang, and Kim Yong -Ik. Yoo’s brightly hued abstractions contextualise the breadth of Korean modern and contemporary art practices while simultaneously documenting it’s evolution.Other highlights include works by artist from their acclaimed international roster such as, Elbphilharmonie Hamburg Herzog & de Meuron Hamburg X 2016 by Candida Höfer, and works by Gerhard Richter and Alexander Calder. Incredibly intricate, and with a touch of tragedy and nostalgia, A+ Contemporary presents the Impermanent Marks series by artist Peng Yishuan. Deriving inspiration from a collection of news footage of the catastrophic events that Taiwan has experienced over the years since the artist’s early memories, Peng Yishuan synchronizes personal and public memories on a whiteboards-an easily erasable surface, for marking, recording and communicating his description of these events. Sliding the mobile whiteboards causes images to stack and layer onto the other, creating a diluting effect on the images comparable to the continuous alternation of information. Visually impactful and interactive, the work immediately compels visitors. Empty Gallery rises to occasion to present a truly distinctive (and distinguished) show featuring works by Chinese-American artist Tishan Hsu spanning the mid 1980s to early 1990s, some of which haven’t been exhibited for over two decades due to the artist’s abrupt departure from the art world in the 1990s. 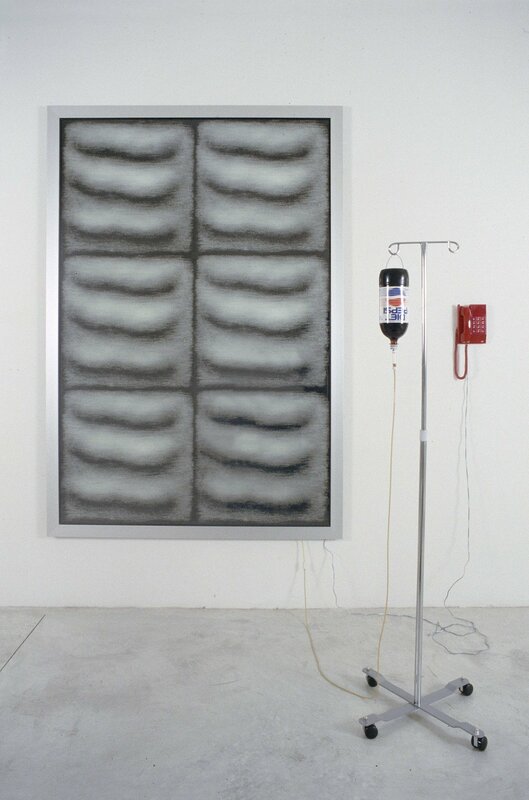 Bound in an aesthetically and conceptually cohesive presentation, works that strike a chord include the installation Feel Forward – comprised of a painting hooked up to what appears to be the equivalent of a Pepsi bottle iv drip and red telephone , It’s not the bullet, but the hole, and Bloody Mary 2. This presentation runs in parallel with a large scale exhibition at the main gallery, showcasing new works by the artist. Representing numerous acclaimed artists, Zeno X’s roster of artist includes the likes of Michael Borremans, Luc Tuymans, and Mark Manders. 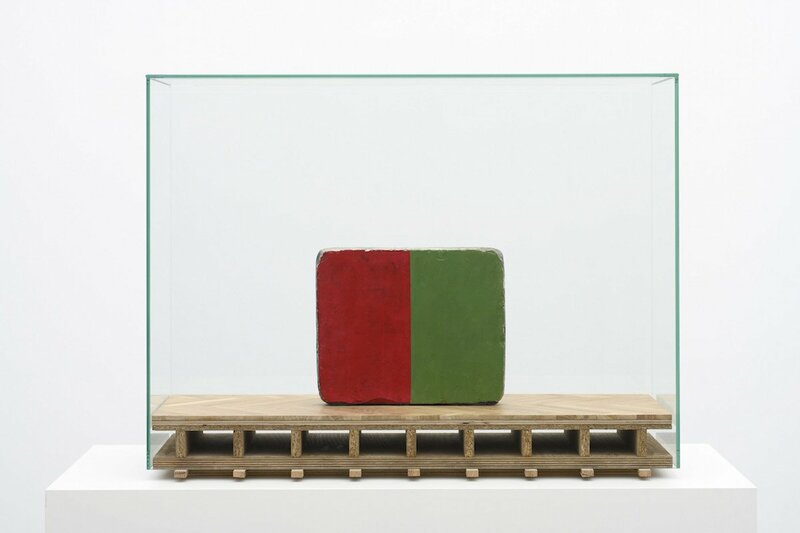 A particularly strong selection of smaller scale works by Mark Manders, who represented the Dutch Pavilion at the 2013 Venice Biennale, prove to be the biggest attractions, in particular Male Head on Wooden Floor, and Composition With Blue Veritcals, and his nod to Mondrian – Composition with Yellow. Unexpectedly compelling, the sculptures and works on paper demonstrate a visual (and conceptual) cohesion evident in Mander’s practice. Luc Tuymans The Kid, and Michael Borreman’s The Laurel, are other highlights. 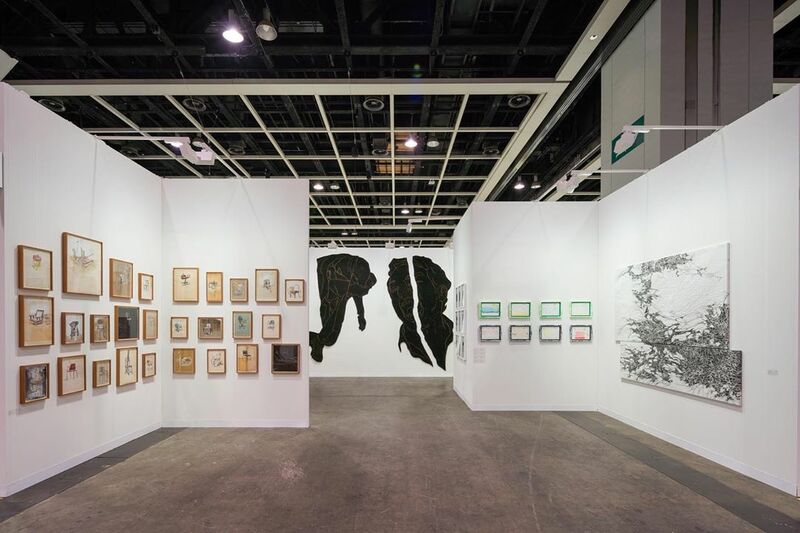 Boasting yet another star studded line up of artists including Abraham Cruzvillegas, Adrián Villar Rojas, Danh Vo, Dr. Lakra, Gabriel Orozco, Haegue Yang and Rirkrit Tiravanija, Kurimanzutto returns to ABHK with a specific curatorial strategy outlining and strengthening ties between Latin America and Asia – that pays off. Presenting works by artists who are expanding their presence in Asia or already have a strong resonance, such as Adrian Villar Rojas considering his recent site specific installation in Tank. 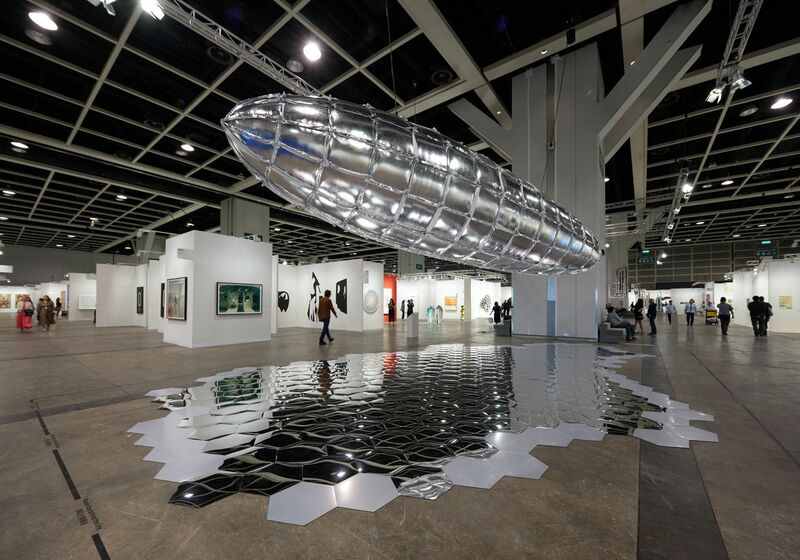 Highlights include Abraham Cruzvillega’s sculptures Reconstruction, and our personal favourite, Rirkrit Tiravanija’s We all dream under the same sky, personally resonating with Hong Kong audiences. Subtle, elegant, and unique, PIFO gallery’s presentation certainly provides a different viewing experience. 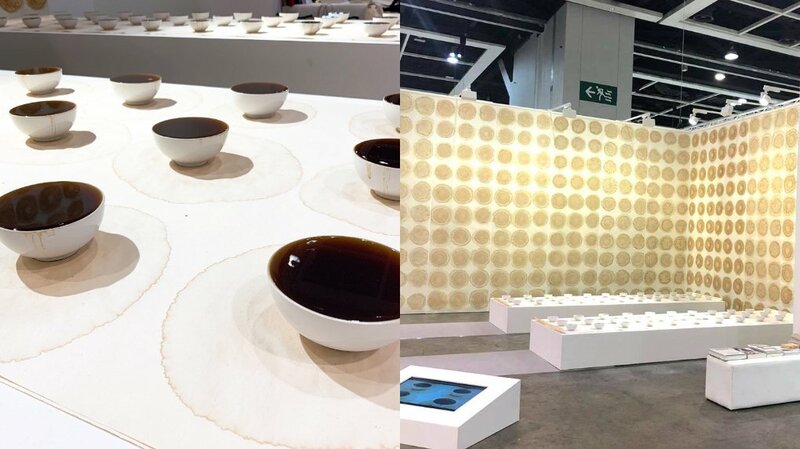 In parts performance, in part sculptural installation, the booth consists of two elevated rectangular surfaces bearing long sheets of paper, lined with half filled cups on tea on top in two rows. 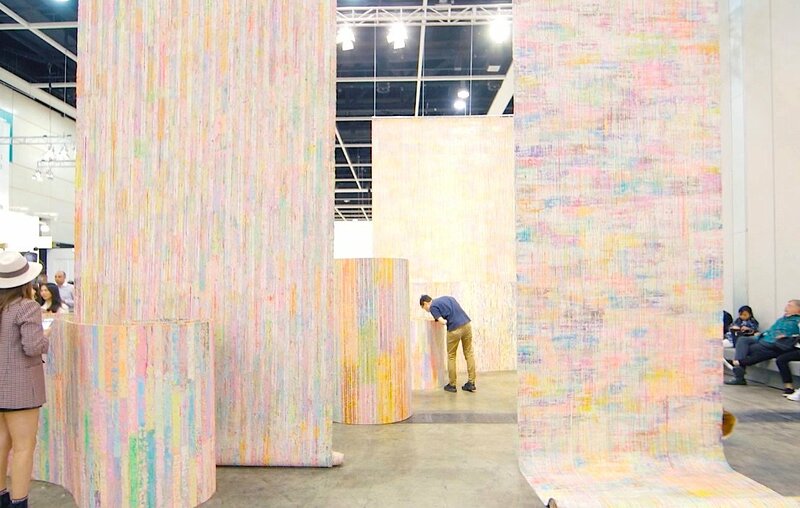 Every afternoon of the fair, the artist will pour the tea onto the paper, resulting in circular brown stains akin to circular rings found on cut tree trunks. 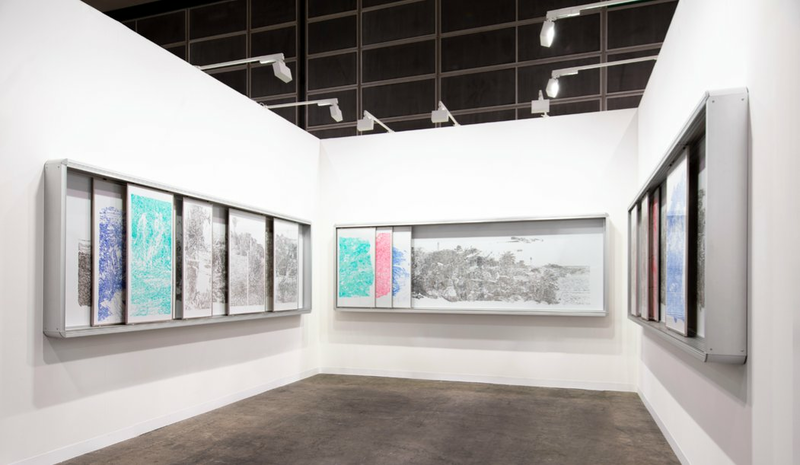 After the tea has dried, the work is complete and hangs on the walls of the booth, evoking a poetic minimalist aesthetic with a nod to Chinese heritage. Back again with yet another impressive selection of works, Experimenter never seems to disappoint. In keeping with their multidisciplinary approach, the gallery acts as an incubator for more challenging contemporary practices. Perhaps challenging themselves this time, they present works – many of which are on paper – by artists who are known for exploring more off beat mediums. Colorful works on paper by Samson Young were a pleasant surprise, while Praneet Soi’s massive display of torn anguish took center stage. Started with the intention to cultivate practices for young emerging artists, and provide a different platform for established ones, Roh Projects is dedicated to developing Indonesian contemporary art. This year, after finally having graduated to the galleries sector they present a group exhibition of artists who from the inception of the gallery have contributed to the formation fo their program. 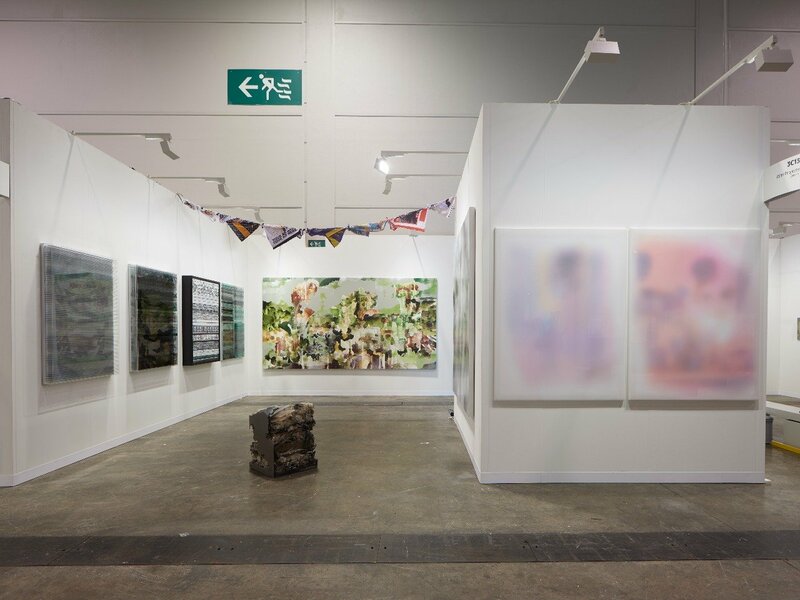 Displaying works in a diverse range of mediums, highlights from the booth include a four panel piece with rotatable segments that effectively change the narrative of the work by Aditya Novali, ethereal paintings by Arin Dwihartanto Sunaryo, and Bagus Pandega’s unmissable, noisy and hypnotizing installation A formative institute. Yes, we know the Encounters section is not a singular booth, but we feel the curation deserves a shout out. Alexie Glass-Kantor curates this year’s edition of encounters – featuring large scale installations suspended across both levels of the fair. From Mit Jai Inn’s massive vibrant canvas maze, to Elmgreen and Dragset’s upside down City in the Sky, to Chiharu Shiota’s breath taking woven installation of boats to navigating Pinaree Sanpitak’s quaint and beautifully crafted series of paper panels, and Jose Davila’s rotating minimalist squares, each installation dramatically transforms the overwhelming stifling halls of the convention center. Simultaneously, reviving the stale art fair atmosphere and opening up curatorial possibilities.